903: “It is not permitted for a woman if she is menstruating or has post-natal bleeding to pray due to saying of the Prophet (salallaahu `alaihi wassallam) concerning the menstruating woman: “Is it not true that she does not pray or fast when she menstruates?” The Muslims are unanimously agreed that it is not permitted for the menstruating women to fast or to pray (the Salaah)..
As for her Tawaaf: If it is the first Tawaaf when entering Makkah (i.e. for Umrah before Hajj) and she is intending to perform Hajj, then a Tawaaf whilst menstruating is not correct (i.e. invalid) according to the majority of the Scholars. And if the Tawaaf is not valid then the Sa’ee (between Safaa and Marwah) after it is also not valid. 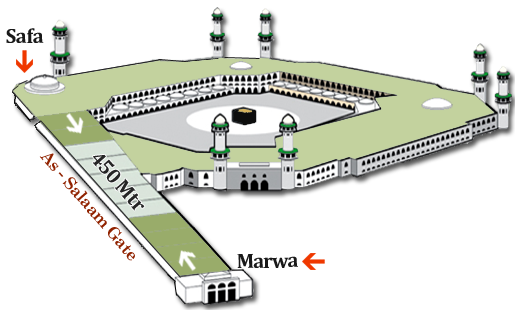 So (if she cannot perform this Tawaaf and Sa’ee) she is now considered one performing the Hajj al-Qiraan (wherein Umrah and Hajj are combined without coming out of Ihraam until Eid day, after fulfilling some of the rites). This is because she enters into the state of Ihraam for Hajj before exiting the Ihraam from Umrah. That is because she is not able to exit her Ihraam unless after Tawaaf, Sa’ee and shortening her hair (after the Umrah). So this Tawwaf and Sa’ee (in a state of menstruation) is not valid. So then when she enters into Ihraam after this, for Hajj (without coming out of her previous Ihraam), she becomes one performing the Hajj Qiraan replacing her initial state of Hajj Tamaattu’ (which is a Hajj wherein one performs Umrah, then comes out of Ihraam completely, and then re-enters Ihraam for Hajj).. Concerning the Tawaaf al-Ifaadah (for Hajj) then that too is invalid for a menstruating woman, except that her Sa’ee is valid because in the most correct opinion of the scholars the Sa’ee can be performed before the Tawaaf in Hajj (unlike in Umrah where the Sa’ee MUST come after the Tawaaf). So if this woman performed a Tawaaf which is Tawaaf al-Ifaadah (whilst menstruating) then she is not considered to have come out her second exiting of Ihraam – and it is necessary for her to go and perform her Tawaaf al-Ifaadah (once she is pure from menstruation). And it is not permitted for her husband to have relations with her until she has performed the Tawaaf al-Ifaadah..
904: A young woman entered Makkah along with her family for Umrah, so she entered into Ihraam (at the Meeqaat) whilst she was menstruating. When they reached the Haram, her period came to an end, and she made Tawaaf and completed (the ‘Umrah) along with her family. She did not informed them because she was too shy, so what is now upon her to do? A woman in a state of menstruation or post-natal bleeding cannot perform the Tawaaf or Sa’ee during her Umrah because the Sa’ee must be performed after the Tawaaf. If a woman in a state of menstruation or post-natal bleeding performs the Sa’ee on the 10th of Dhul-Hijjah (or later) without her Tawaaf, then it is valid because the Sa’ee does not have to be performed after Tawaaf during the Tawaaf al-Ifaadah, rather it can be performed before the Tawaaf on this occassion.